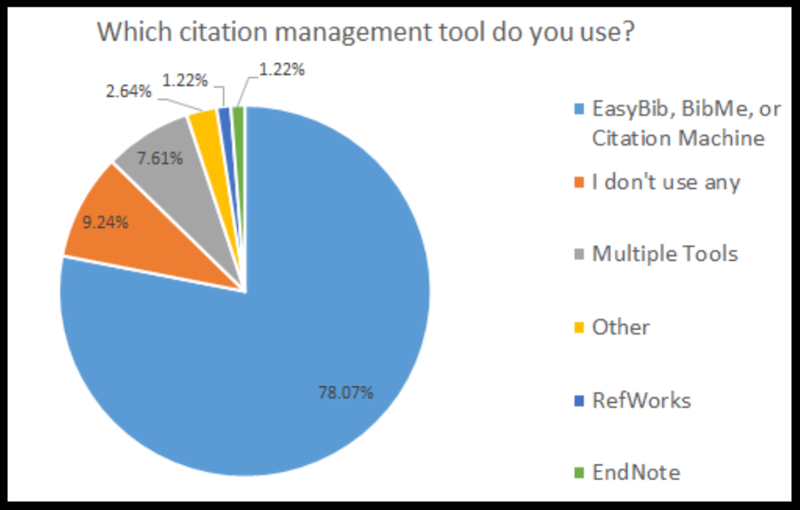 The main purpose of RMTs is to gather citation information and generate a citation or bibliography in the citation style of the researcher’s choosing. Certain RMTs also allow researchers to store PDFs in various folders for reference or later use. Specific Feature Comparisons between PowerNotes and RMTs. The sections below compare several features associated with PowerNotes and RMTs. PowerNotes: PowerNotes was designed for users familiar with modern technology who expect a certain degree of ease-of-use. We frequently test ease-of-use with current students to ensure that they “figure it out” in a very short amount of time without training. RMTs: Most RMT’s require extensive training to use, which limits their use for most undergraduates. RMTs are designed for experienced publishers with functionality that is only intended for a small percentage of researchers, which hinders widespread use. The steep learning curve of RTMs makes them ill-suited for undergraduate students working on discrete assignments that can be completed over a short period of time. Unsurprisingly, the RMT that enjoys dominant usage from undergraduates is EasyBib (78% adoption), which has a modern and intuitive design meant for today’s undergraduate population. The chart below illustrates the RMT of choice for 985 undergraduate survey respondents. PowerNotes: PowerNotes used the latest cognitive studies to implement best practices in reading support throughout its design. We designed the PowerNotes interface to minimize distractions endemic to current research practices and foster deep reading. For details on our research and how we implemented these reading features, we recommend that you read this post. RMTs: We could not find any RMTs that offer any reading benefits. Indeed, many of the RMTs’ highlighting and annotation tools are designed such that they actually introduce distractions into the reading process, and they do so in at least two ways. First, all RMT annotation tools cause researchers to look away from the source to access the highlighting and annotation functions in a different area of the browser or application. Second, researchers have to make numerous decisions about how they want to mark something up, sometimes requiring several clicks to highlight or annotate a single passage. PowerNotes: PowerNotes is designed around highlighting, saving, annotating, and organizing passages. These actions are combined into a single, seamless workflow to maximize efficiency. Also, we chose to focus on passages because they are the fundamental building blocks of information used in source-based writing. Whether used as direct quotations, paraphrased, or summarized, passages are the raw materials researchers use to support their positions. We also understand the importance of context for each passage and how passages fit into an overall document, which is why we allow researchers to annotate every saved passage, and always gather the source link and citation information, allowing researchers to easily reorient themselves and return to the original document as necessary. RMTs: RMTs are typically designed around collecting, annotating, and organizing citation information and citations. While it’s possible to tie citation organization to paper organization, difficulties arise when a researcher finds multiple aspects of a single source that would be useful to support different aspects of their thesis. While many RMTs allow researchers to save, highlight, annotate, and organize entire PDF documents through the use of folders (except EasyBib which does not save files), none of them allow researchers to easily access those highlights or notes within the documents, which limits their use for writing. In addition, the markup and organization actions are separate, cumbersome, and inefficient. For most RMTs, users must save documents before highlighting, annotating, or organizing. Then the user must separately activate either, and subsequently toggle between, the highlighting or annotation tools, while also placing the source into a folder for organization. Without the ability to save and organize passages separately, users are left to employ other processes to facilitate the critical analysis necessary to effectively use sources in their writing. For this reason, researchers almost always use a separate process for organizing or outlining their research apart from RMTs. PowerNotes, by contrast, combines these processes by automatically attaching citation information to passages, which students can directly annotate and organize to facilitate the transition from research to drafting. PowerNotes: PowerNotes prompts users to organize any passage, from either an html or PDF source, as soon as it is captured. Users can view all the passages they saved on a single page for easy reorganization via drag-and-drop or by using a menu. RMTs: RMTs allow researchers to save PDFs and organize them in folders. Like most foldering systems, reorganization becomes difficult because users must go into each folder to view each document to understand how they want to reorganize. Users can only organize and reorganize at the document level, not the passage level where it is more useful. In addition, RMTs only save PDFs and saving an HTML source, while possible, is very cumbersome. PowerNotes: The outlining and reorganization features of PowerNotes allow researchers to progress from basic research, to topical outline, and finally to conceptual outline. Our goal is to give researchers a process that puts them in the best position to write their first draft -- the most difficult step in the source-based writing process. RMTs: We could not find any RMTs that offer any drafting benefits. PowerNotes: PowerNotes automatically saves citation information and the link back to the source for any passage that the researcher highlights. Notably, PowerNotes attaches citation information to passages when the passages are saved, providing a better user experience that is less prone to plagiarism than gathering citation information at the end of the composition process. Indeed, our research shows that a large majority of undergraduate students do not gather citation information or think about generating a bibliography until the end of the composition process, increasing the likelihood of plagiarism. RMTs: RMTs require the user to actively, and separately, capture citation information in addition to highlighting or annotating. This allows users to conduct this critical step at any stage of the research and writing process. Unsurprisingly, most students save this step for the end. Plagiarism issues often arise when students do not save citation information during the gathering and organization of information, and are then unable to locate a source that they read in the past. export citation information to RIS format, which researchers can upload into the RMT of their choice. RMTs: RMTs format citations in a number of styles. They generate bibliographies as well. For more information on how PowerNotes works and how it can help educators click here.